I know, 2 posts in a row. Please pull yourself off the floor. I have some backlog waiting for photo editing and text. We will resume to normal non-posting schedule shortly. 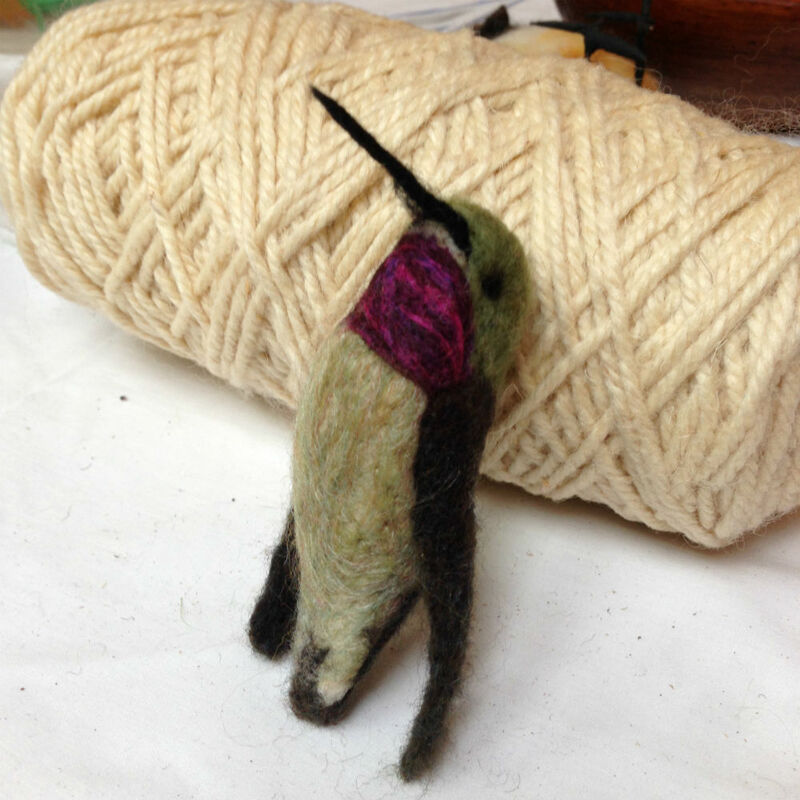 Our felting group worked on needle felting small birds this month. 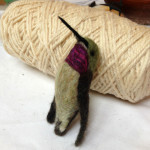 We all decided to work on hummingbirds, because they were small. Ha! Small doesn’t mean a light on details! I think an owl would have been faster. No in progress photos, unfortunately. What you see is 100% wool. The inner core was some unknown wool batt that Ginger had on hand. I rolled that into a cylinder and started to prick the heck out of it to make a very small dense core in the rough shape of a hummingbird body. 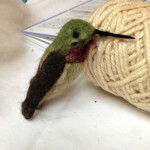 I took a small amount of black wool and wrapped that around a toothpick to make the beak. I then gently pulled it off the toothpick and wet felted it into shape. I was too worried about my fingers to try needle felting something that small. Then, I covered the body with scrap wool from my various spinning classes. Most of it were from Ashland Bay, I believe. The throat was a mix of black, pink and purple blended with my fingers. The wings were roughly shaped separately before felting into the body. It still need a bit of trimming to shape. I also need to decide on what type of feet to attach and how to perch the bird. Believe it or not, the hummingbird is fairly true to size (length) and weight of an Anna. So happy with this. Unfortunately, I found the little bird next to Stormy’s food bowl yesterday. I am not sure how she got it off of the high shelf it was on but she thinks its a cat toy. I need to clean it off a bit — get rid of the cat hair. Sigh.